It’s not entirely clear how the decision to try a cruise control burnout on this poor Dodge Grand Caravan rental came up, but it’s just what ended up happening when YouTuber Cletus McFarland came to California to visit the Hoonigan headquarters and to watch his brother graduate on the side. If there's anything to be known about Hoonigan, it's that the company's headquarters are a proper place to pull this stunt off, but using a front-wheel drive minivan built to haul families around means the process involves some coaxing. 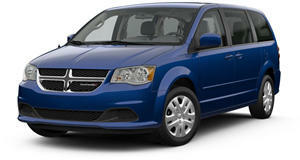 Unlike a rear-wheel drive car that can lock its front wheels without biting down on the rear brakes too hard—allowing the back tires to spin and the fronts to hold the car in place—McFarland had to figure out a way to get the Grand Caravan to stay stationary in order to break traction and roast some tires. A nearby Ford F Series truck makes that easy. Just take a tow strap, attach one end to the heavy truck and the other to the minivan and viola, suddenly the engine’s energy has nowhere to go but into converting the tires' coefficient of friction from static to kinetic (break traction). When tarmac releases its grip on the tires, McFarland tries to set cruise control in order to hop out of the van and make this stunt a whole lot cooler, but the cabin quickly fills with smoke, making it near impossible to see the dashboard and work with a stubborn Grand Caravan cruise control system. At least the primary mission was accomplished. His reward? Likely a rental car rep that wants to know where the rest of the front tires went.